Wed, Apr 10, 2019, 12:37 pm SL Time, ColomboPage News Desk, Sri Lanka. Apr 10, Colombo: Workers of Sri Lanka's premier mineral sand miner Lanka Mineral Sands Ltd (LMSL) in Pulmoddai have received a bonus of Rs 100,000 each on 8 April as the company's state controlled mining operation reported huge profits last year. 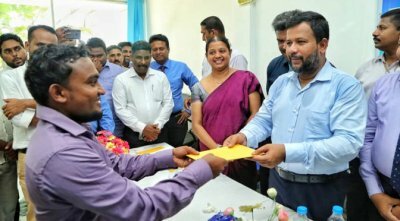 Rishad Bathiudeen, Minister of Industry, Commerce Resettlement of Protracted Displaced Persons, Cooperative Development, Skills Development and Vocational Training, awarded the bonus checks to the employees at the company's Pulmoddai plant premises on April 8. "I wanted to reward you with a bonus of Rs 125,000 but due to recent trade union actions, I am only able to give Rs 100,000," the Minister said addressing the bonus award session. "During the previous weeks there were strikes and other trade union actions here, and they disrupted this plant's smooth production process. The Trade Unions were drawing the innocent workers to their protests and getting them into trouble. If you have grievances, you should directly complain to the LMSL management instead of resorting to strikes. If these strikes did not take place, you would be collecting a bonus of Rs 125,000 today instead of Rs 100,000. Due to trade union action, bonus rates have come down and you have lost a bigger pay-out," Minister Bathiudeen said. He said that some people are speculating that the Pulmoddai mines are to be sold to private buyers but neither the government nor his Ministry has approved transfer of the profitable Pulmoddai deposits to any local or foreign buyer. "As long as these mines are under me, they will not be allowed to be privatized," Minister Bathiudeen said. The Lanka Mineral Sands, a fully-owned state company reported Rs 676 million net profit after tax in 2018. The key products that LMSL markets are Ilmenite, Rutile, Zircon, and "Ilmenite with by-products". In 2019/'20, LMSL plans to expand to Value Added Products and to establish a new mineral processing plant in the vicinity of Kokillai.